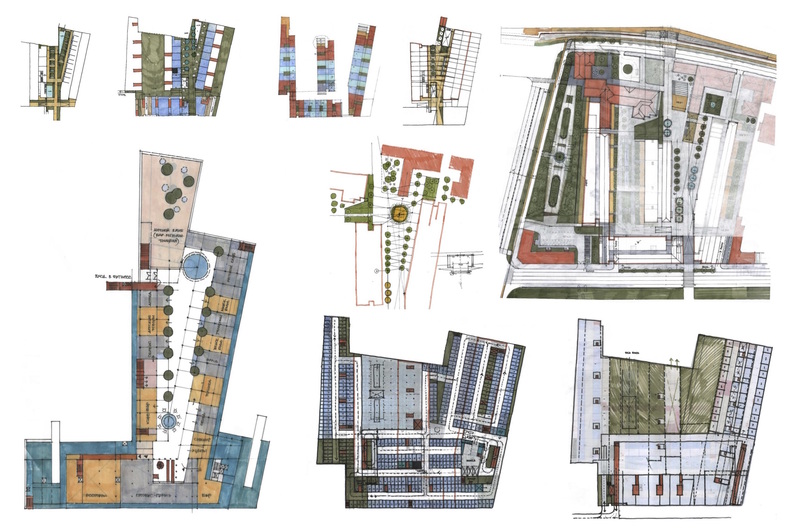 The plot of land which was offered for contest design proposal is a wasteland overgrown with weeds, forgotten by residents, concealed from passerby glances, completely taken off from city life still flowing around it. 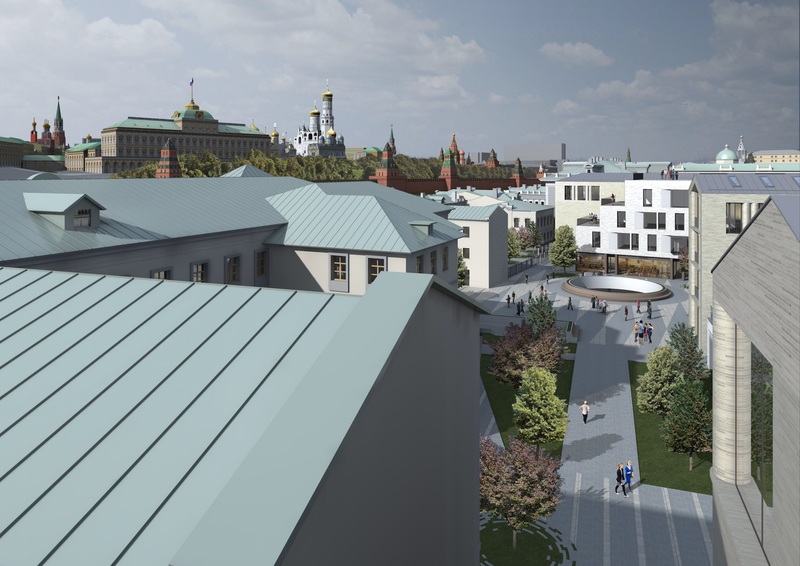 And at the same time we know that this bare land lays not in the outskirts of a huge town but is situated 150 meters away from Moscow Kremlin right in the center of the capital`s business, tourist and residential zone which [constantly] undergoes intensive development . 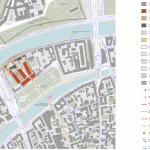 It is closely surrounded with dozens of memorial places and historic sights of global significance all in the area listed by UNESCO. 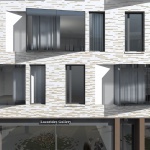 This is the site-paradox, the ghost site. 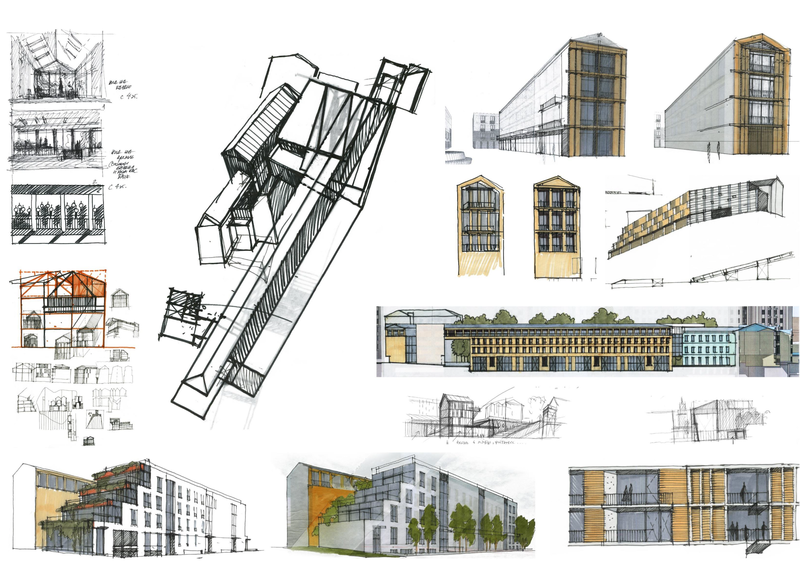 It managed to live through endless chain of events, epochs, ambitious ideas and projects. 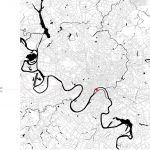 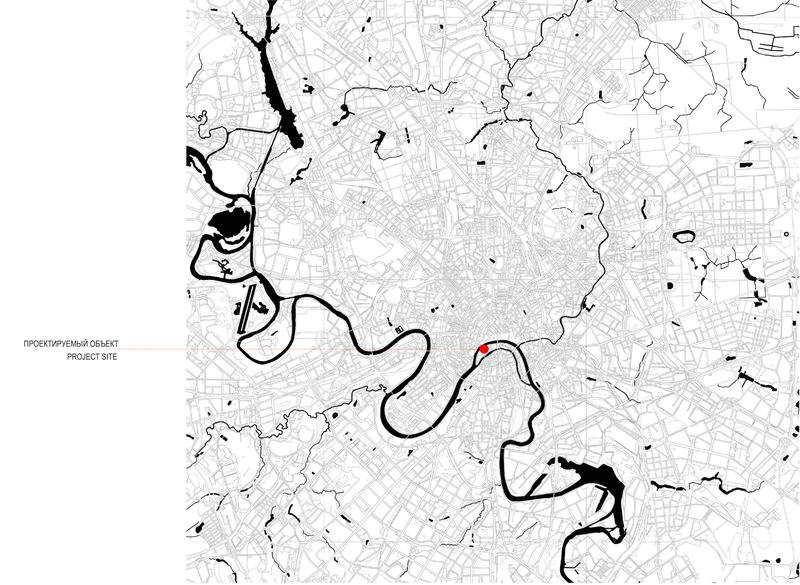 Its uniqueness is easily explained by location and by context. 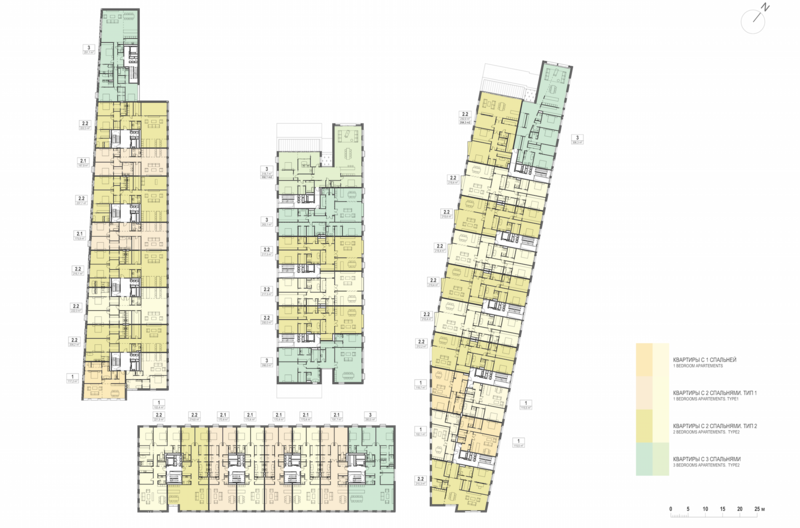 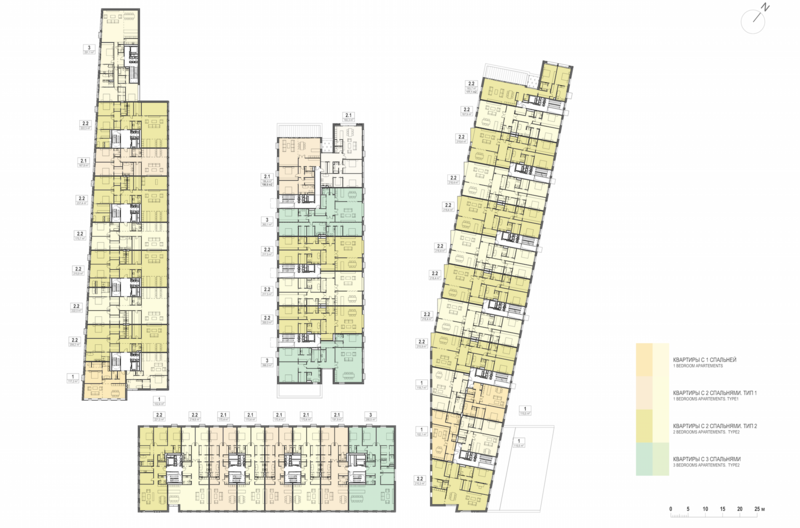 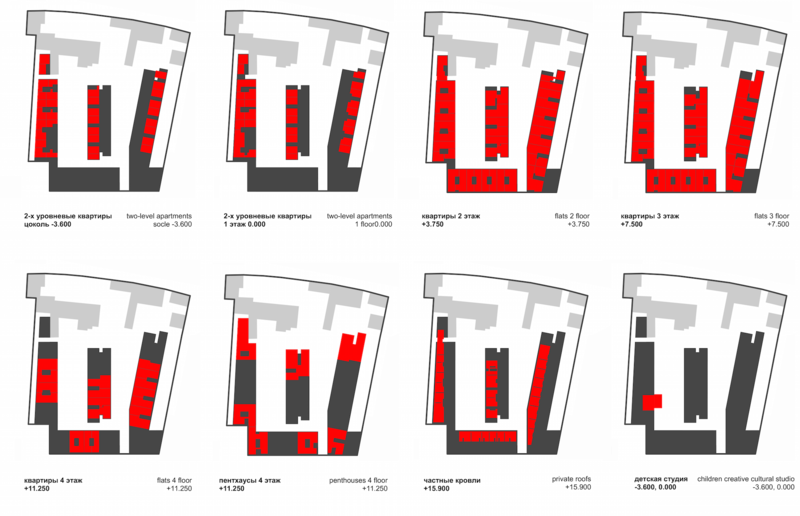 Not only the complexity of its development program, and the abundance of limitations and requirements, but also the demand for new quality of city space have foredoomed this uniqueness. 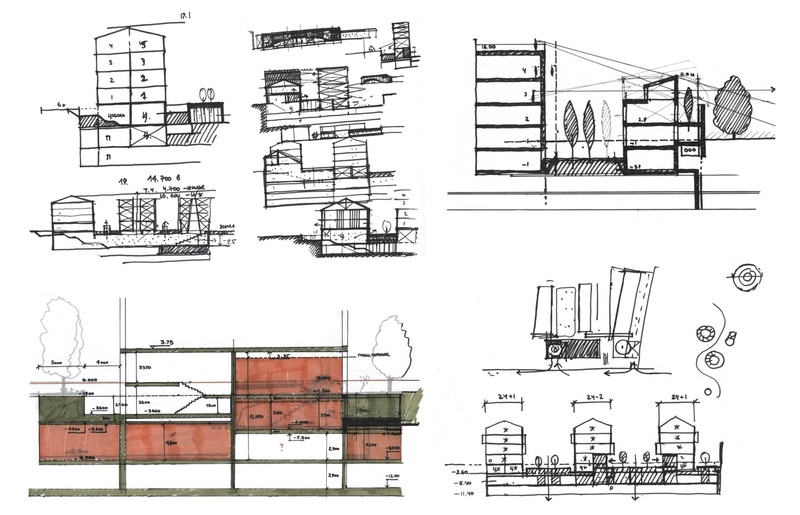 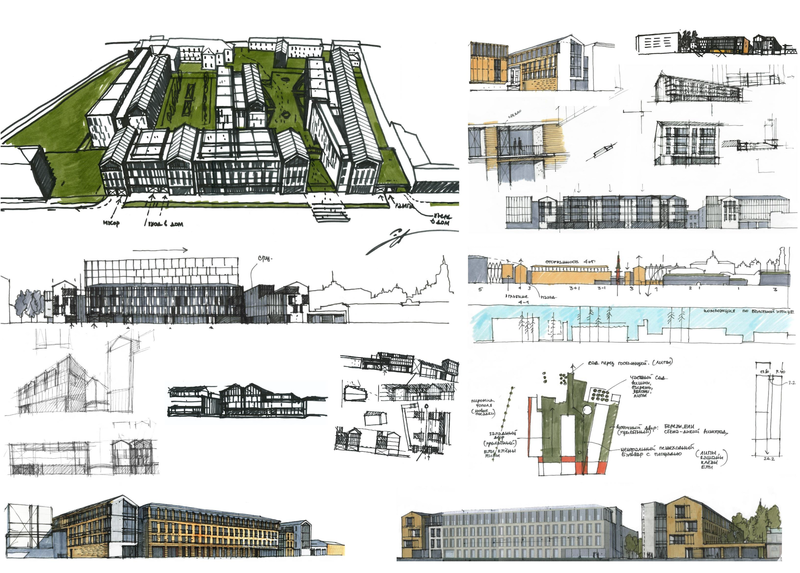 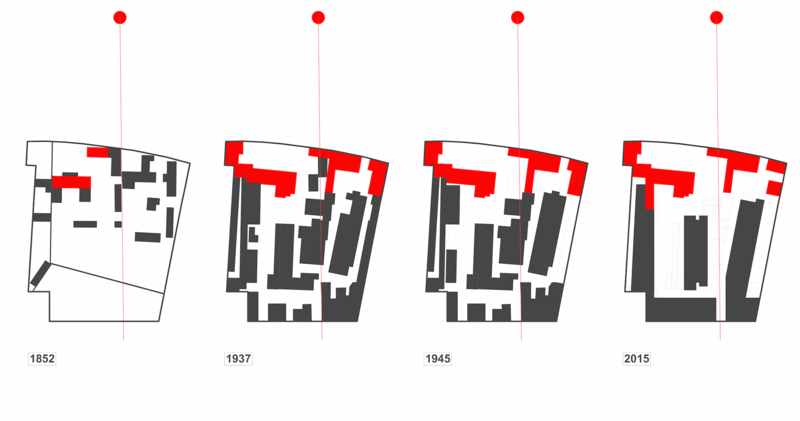 Clearly, architectural “thinking by buildings” must be altered in favor of a more contemporary approach to municipal development, based on complex principles of modern urbanism. 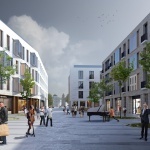 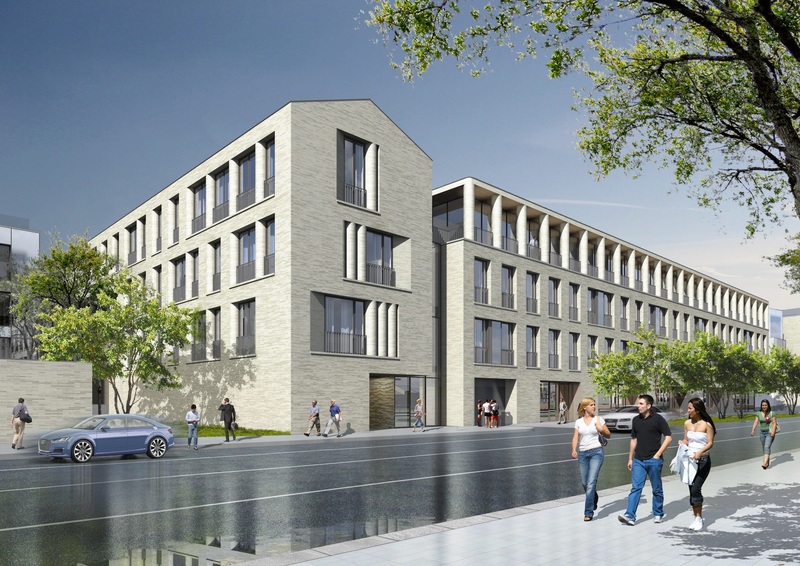 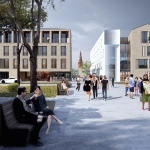 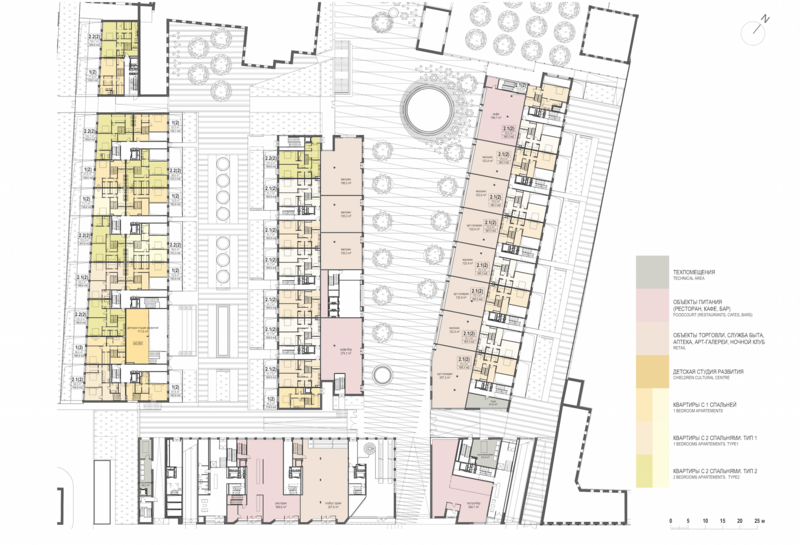 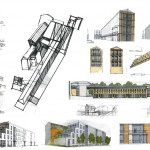 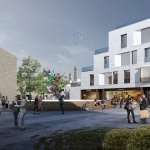 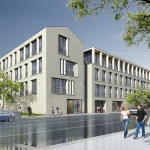 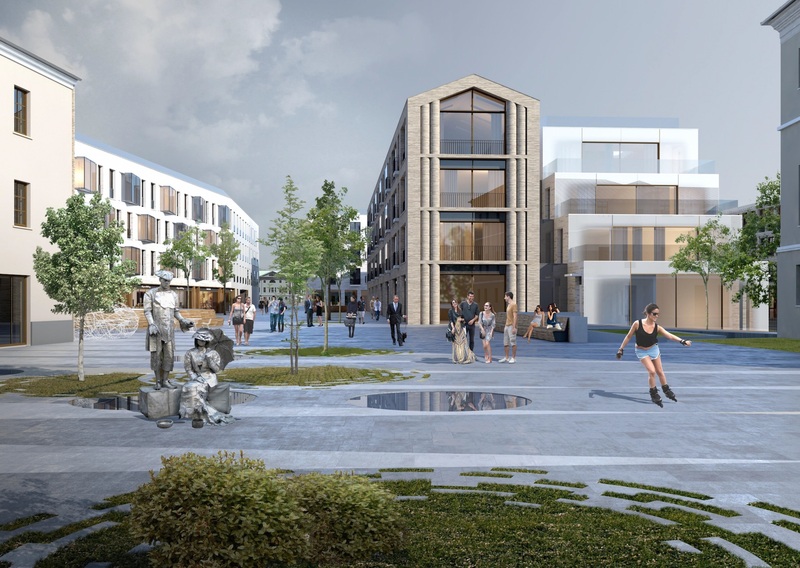 The main task of the project is to create a new city block with full range of functions which correspond to modern views on comfort in urban environment. 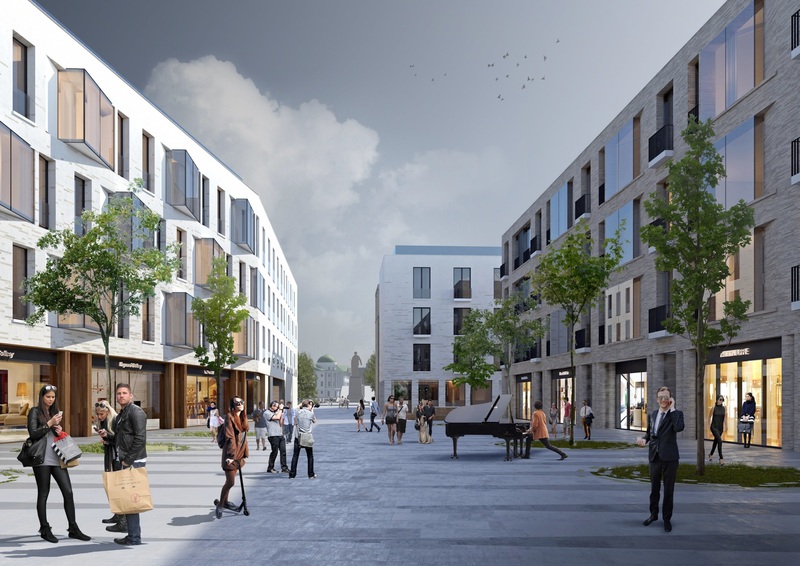 Well planned coordination and integration of residential, recreational and commercial spaces around public pedestrian zone are based on the “living space” principle of the town. 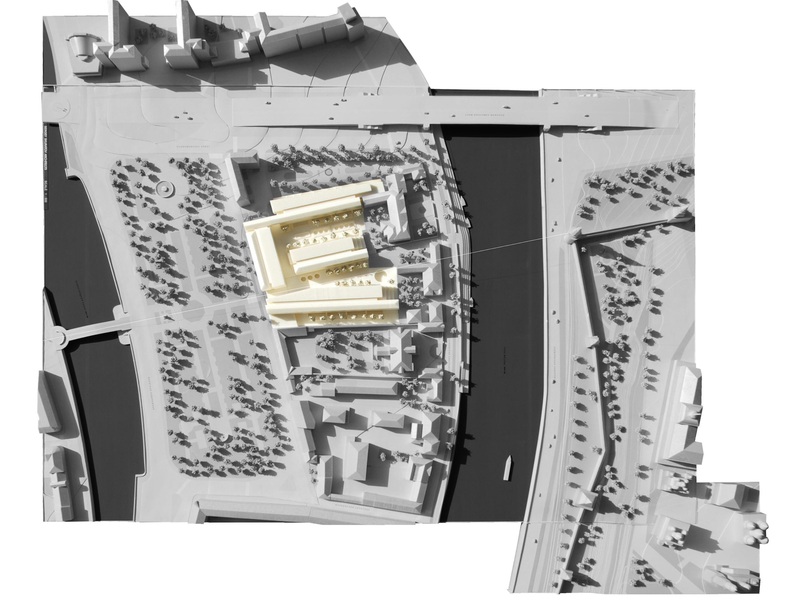 It allows people of various ages and social origin to share the city space during a day and thus animate and fill it with life. 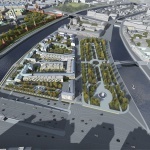 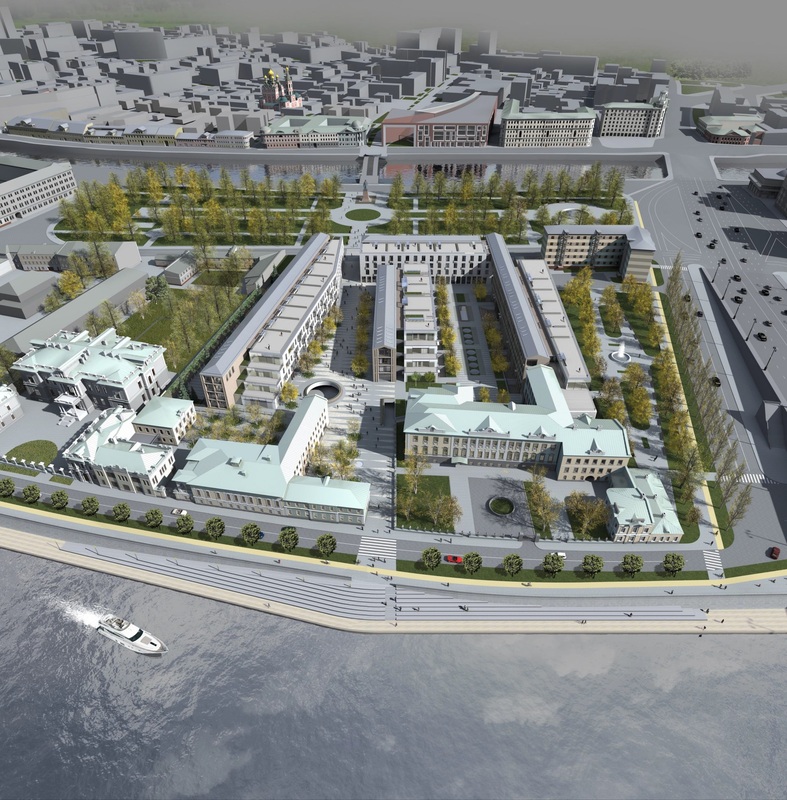 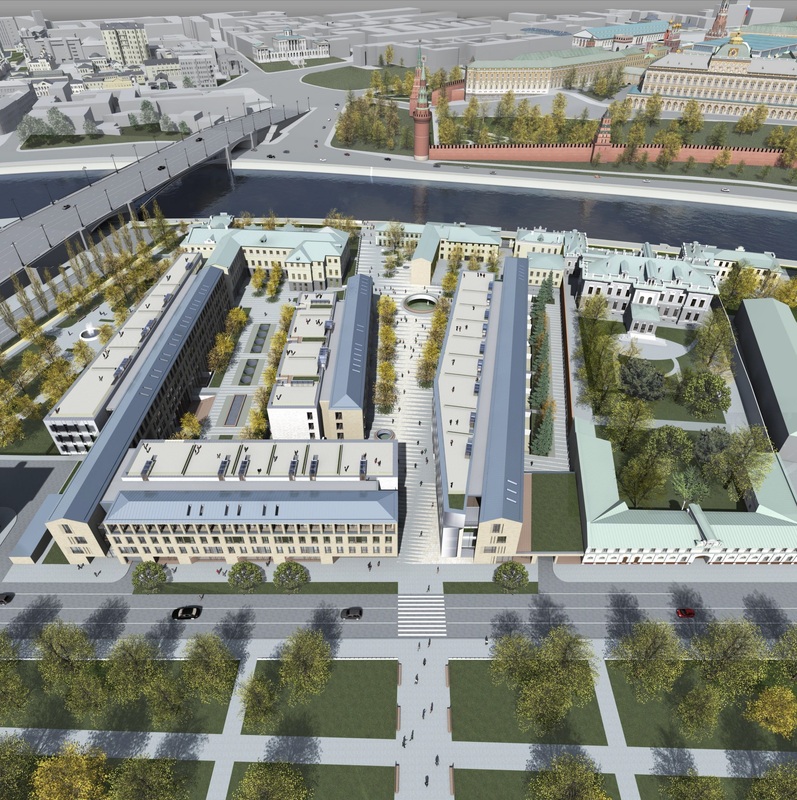 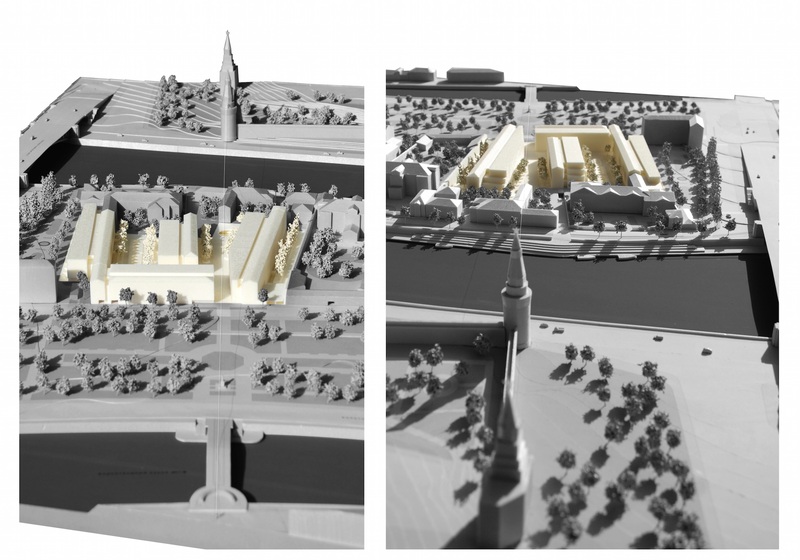 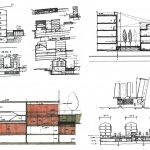 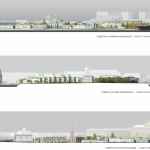 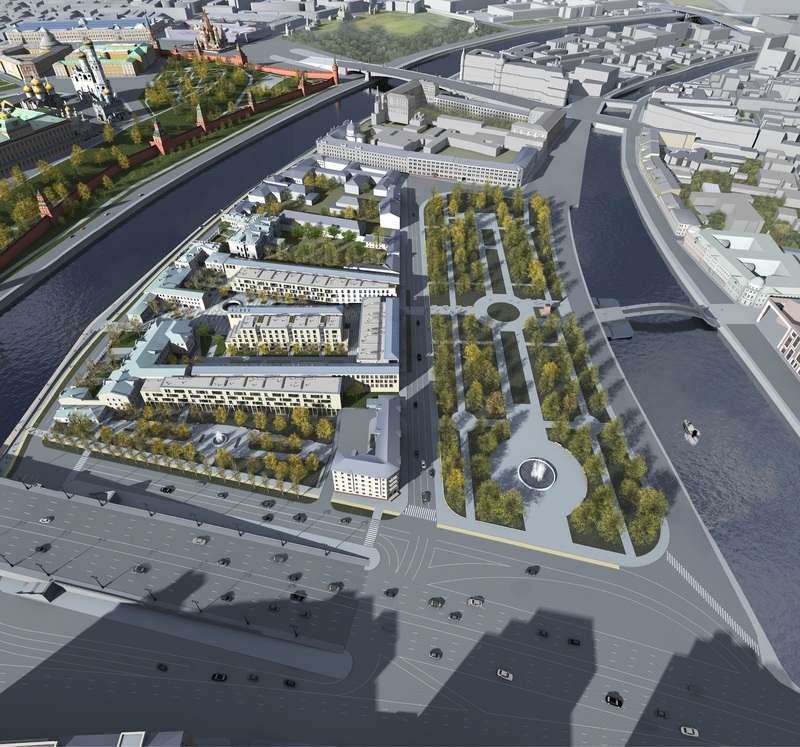 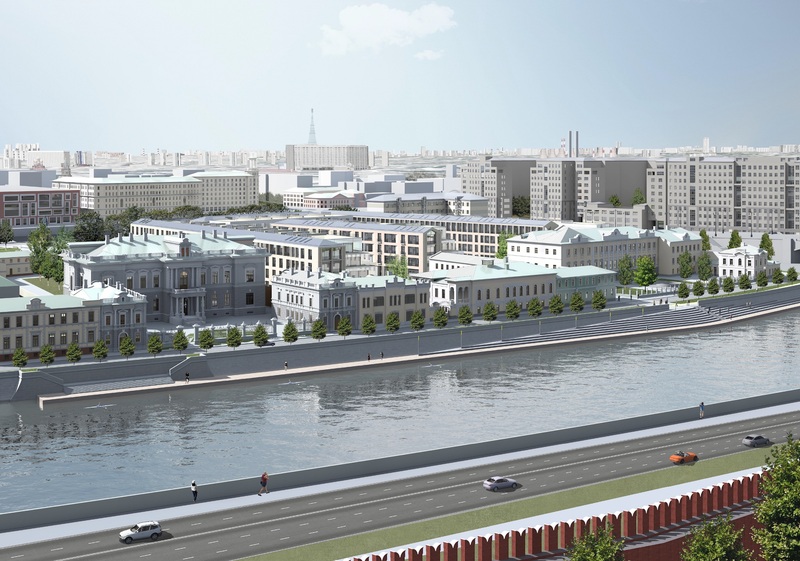 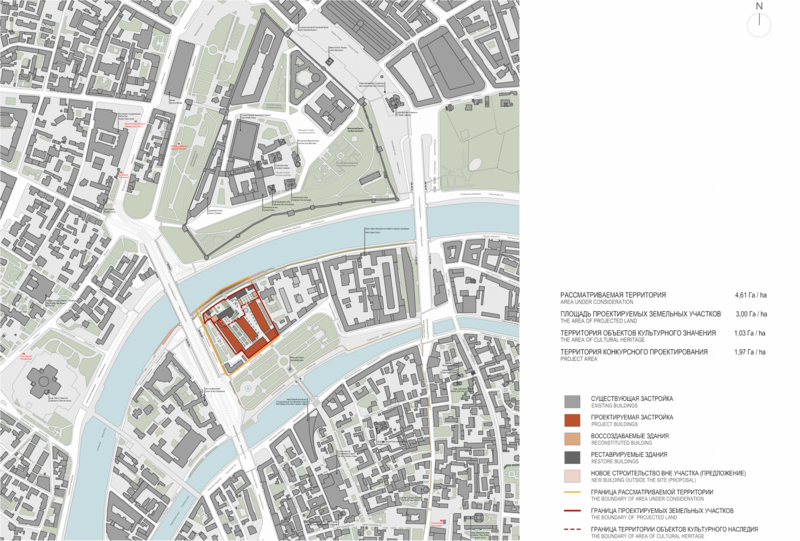 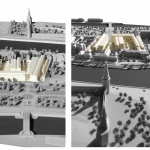 This project uses maximum of communicational capacity of the location, composing an urban axis from the Tretyakov Gallery along Lavrushinsky drive – over the Luzhkov bridge, then through the center of Bolotny Park with a monument to Repin till Sofiyskaya embankment and Kremlin. 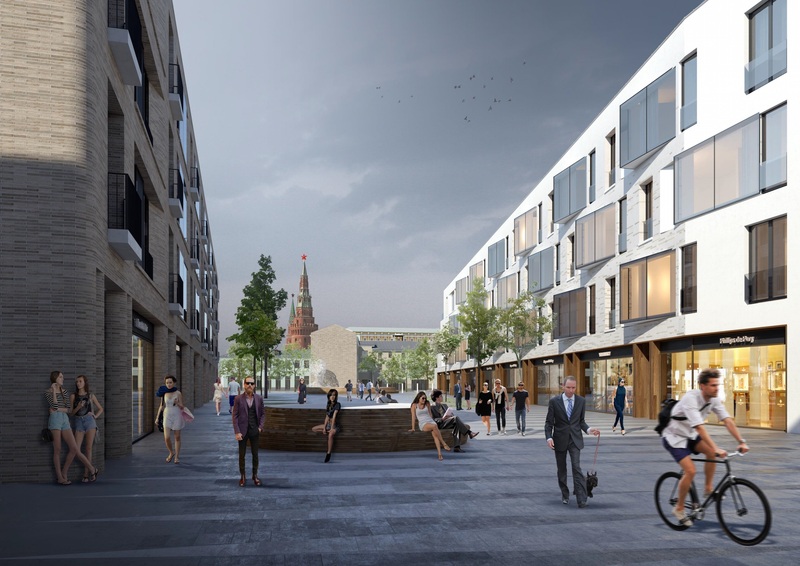 Along the axis we produce not only a new walking promenade connected with pedestrian space at Red October, but we also open a visual perspective from Zamoskvrechye district onto the Vodovzvodnaya Tower in Moscow Kremlin. 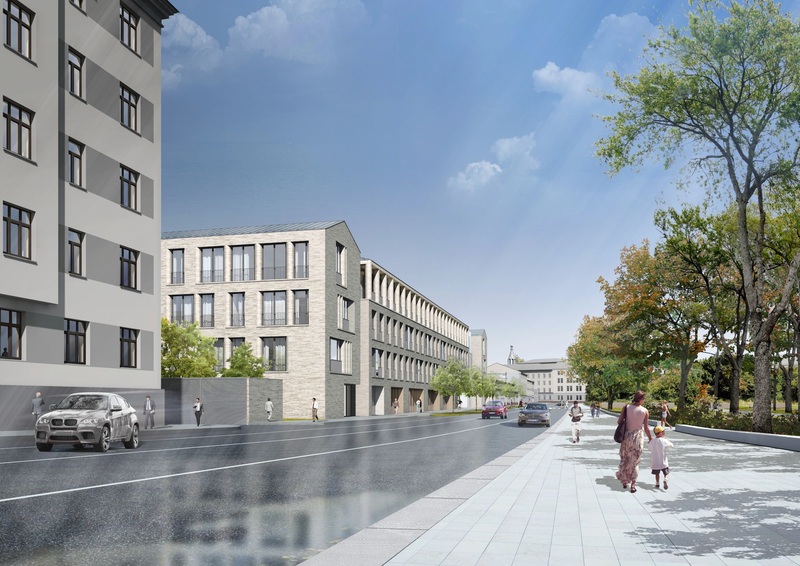 The project changes the quality of city environment in principle by saving pedestrians from routine necessity to walk along narrow paths together with heavy road traffic. 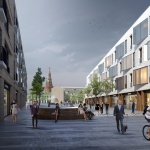 Thus a comfortable free space for safe and unobstructed movement gets formed, significantly diversifying the walking itineraries and possibilities in the city. 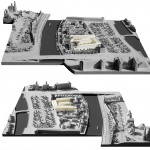 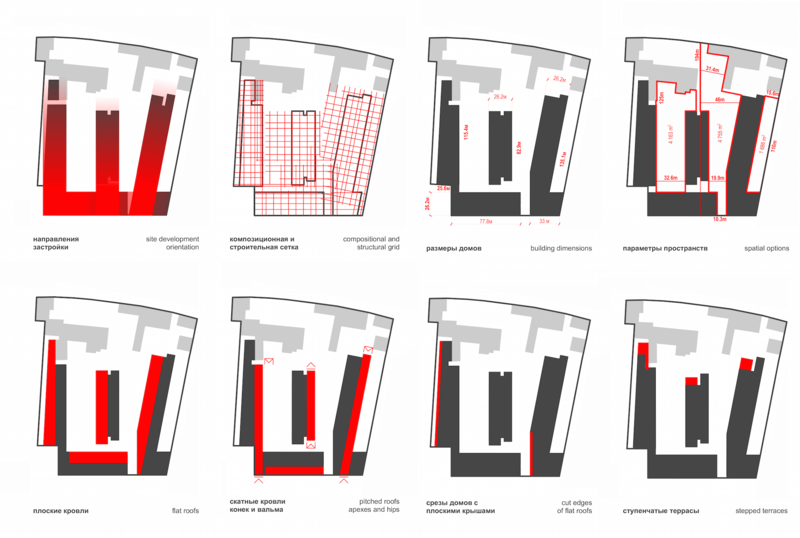 The task of regeneration of the completely destroyed part of urban territory in the very center of metropolis gets solved with consideration to traditional space planning structure and historical legacy. 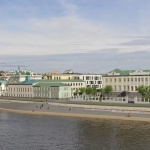 Solid and uninterrupted facades hold on the rigid scale of the capital city in challenging juxtaposition with mighty volumes of House on The Emankment, of hotel Balchug and new Tretyakov gallery block. 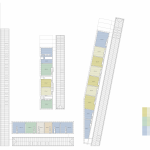 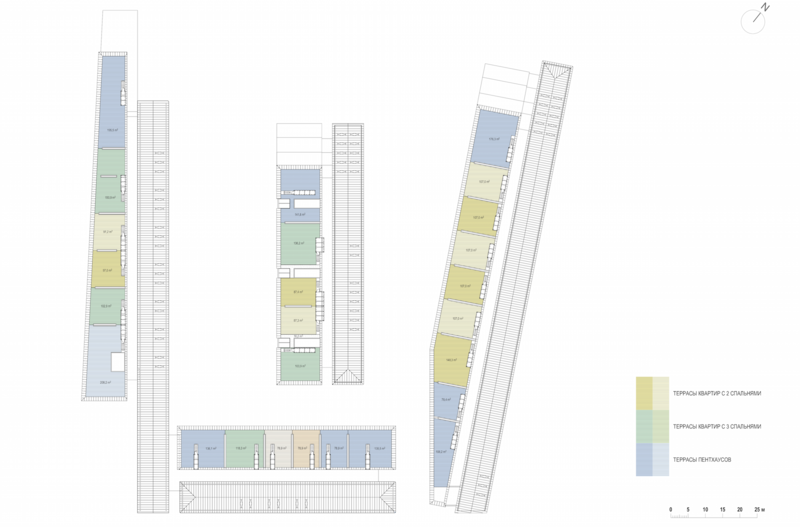 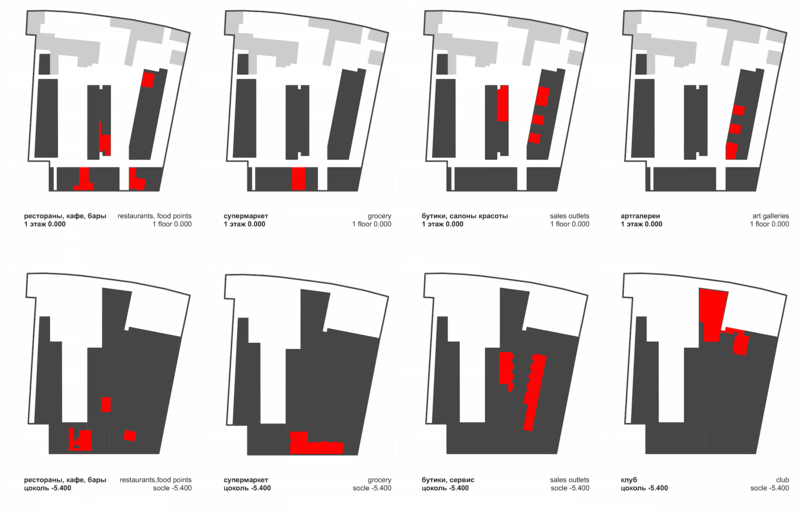 At the same time bulky architectural volumes are divided into parts – vertically on facades and horizontally by roof lines. 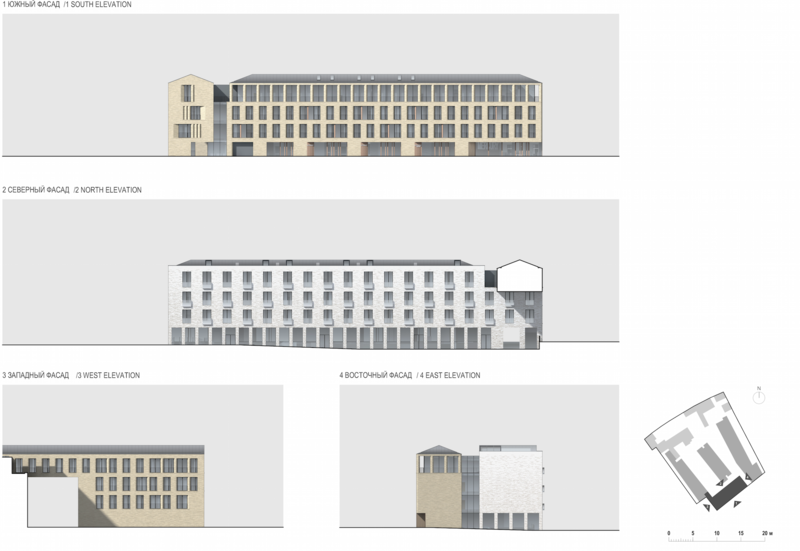 Thus we get chambered rhythm, skewed facades and vivid sculpturesque spaces very typical for old towns. 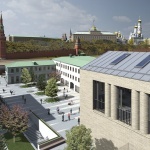 The new axis of pedestrian route is oriented on the beautiful Kremlin tower quite in line with old tradition. 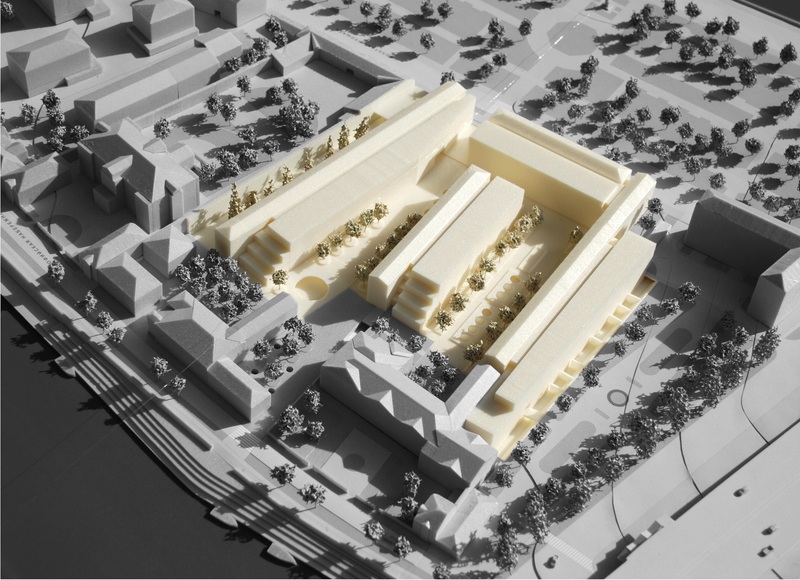 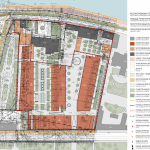 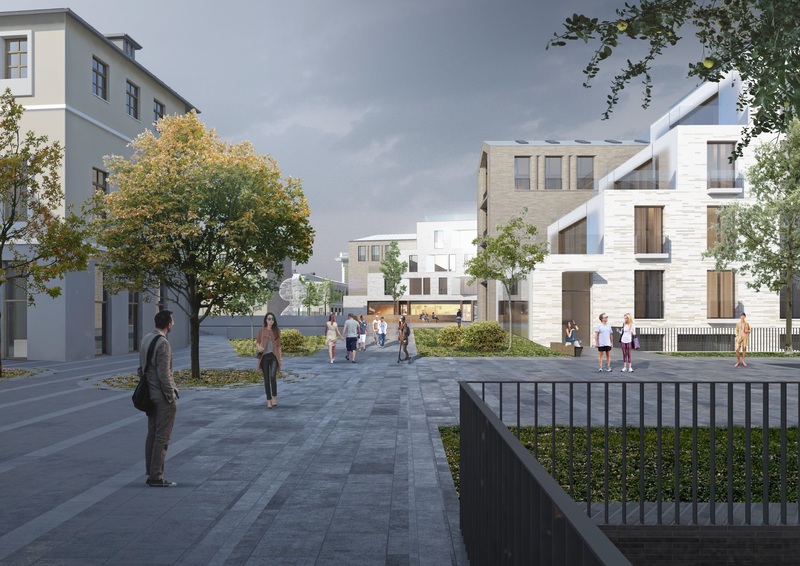 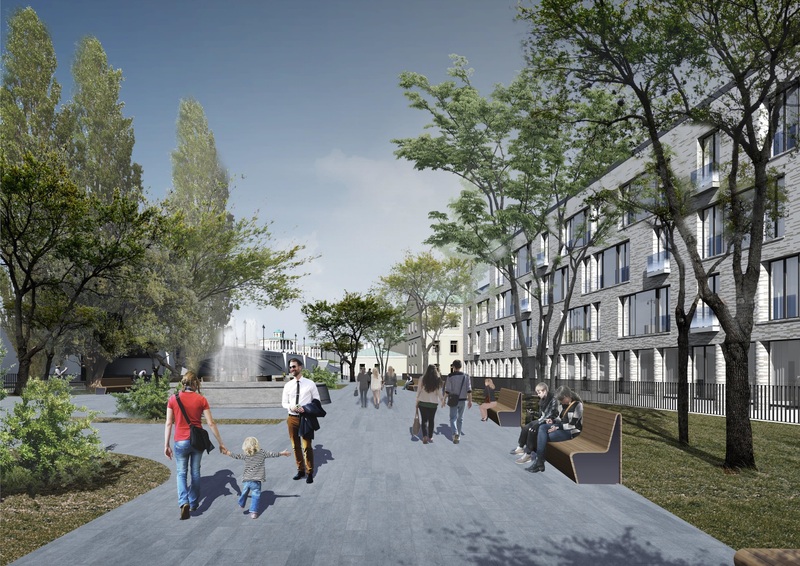 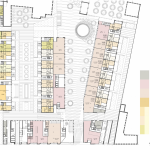 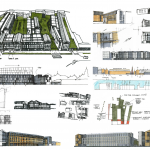 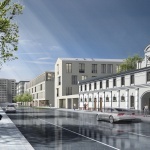 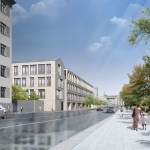 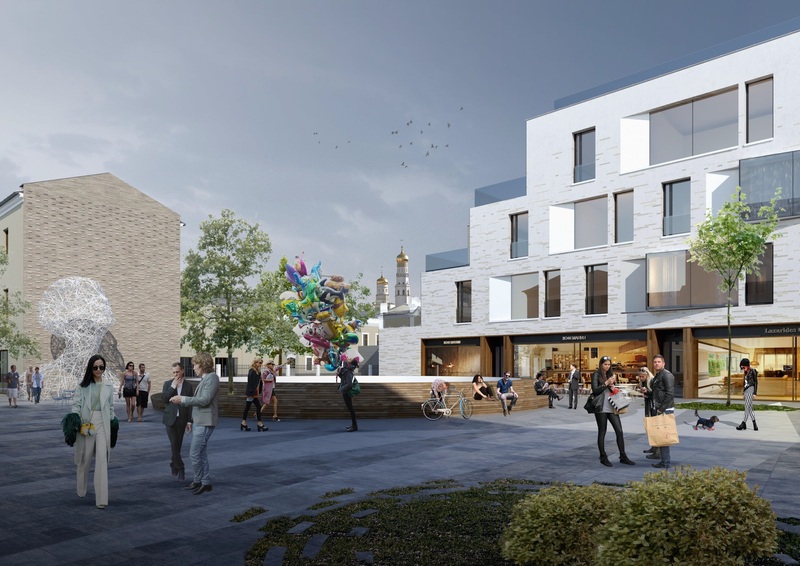 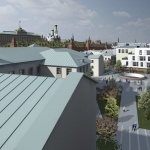 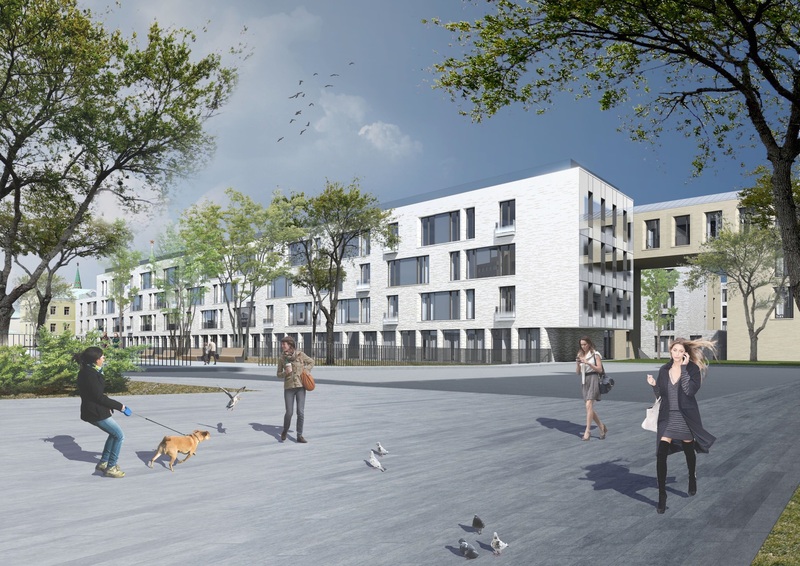 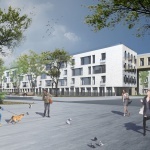 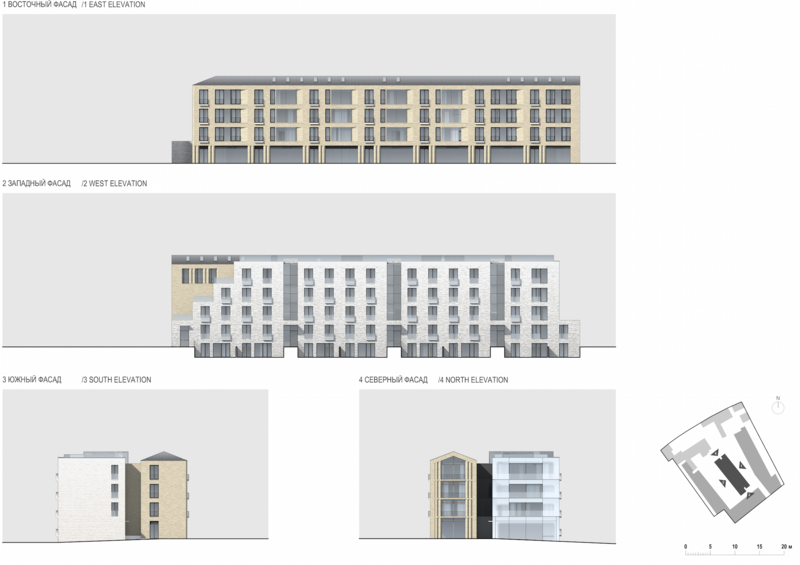 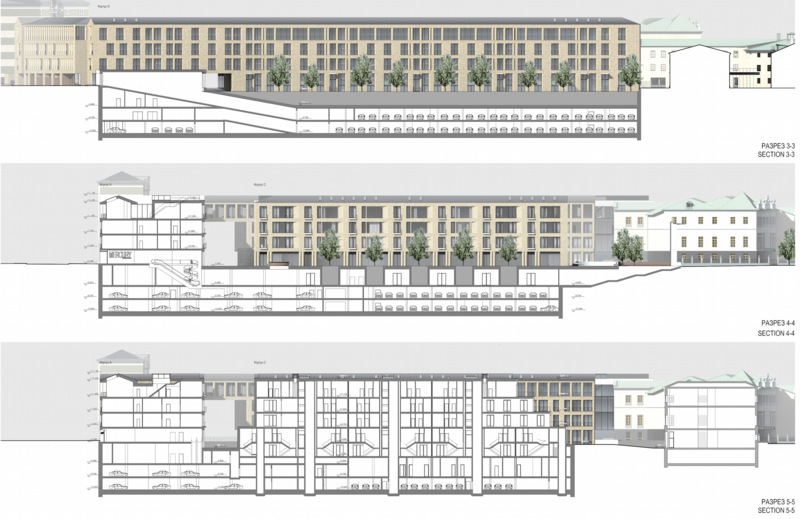 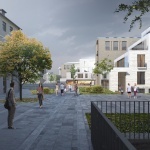 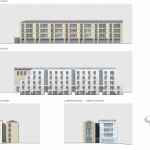 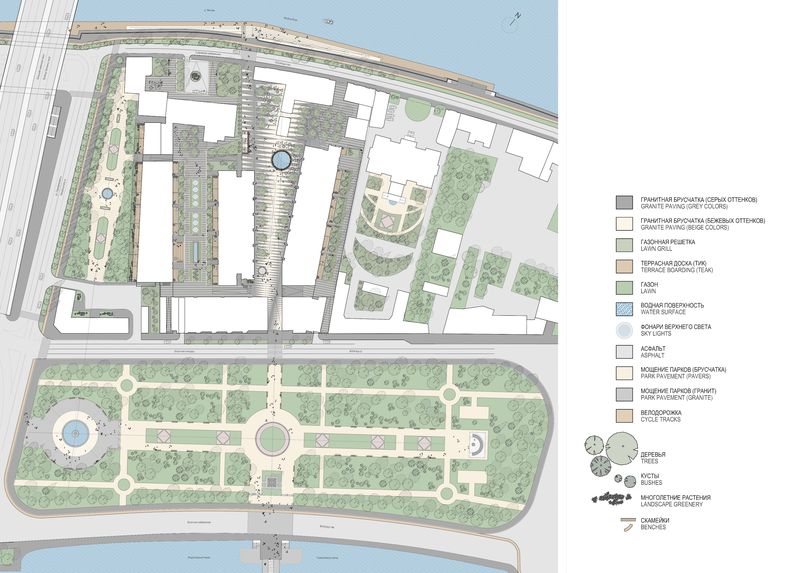 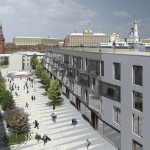 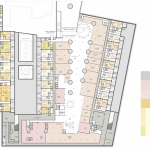 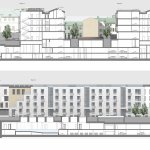 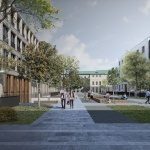 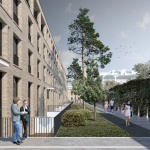 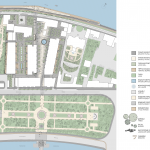 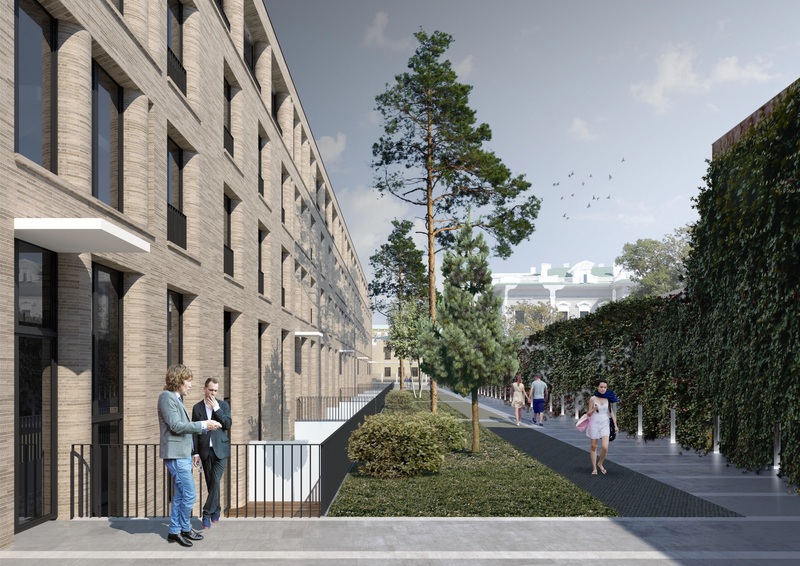 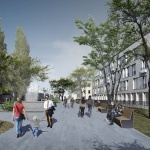 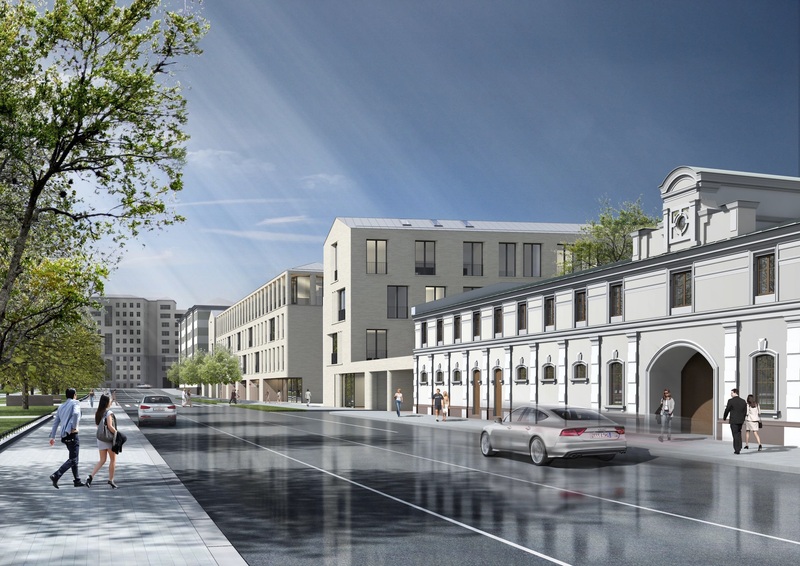 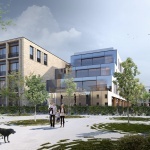 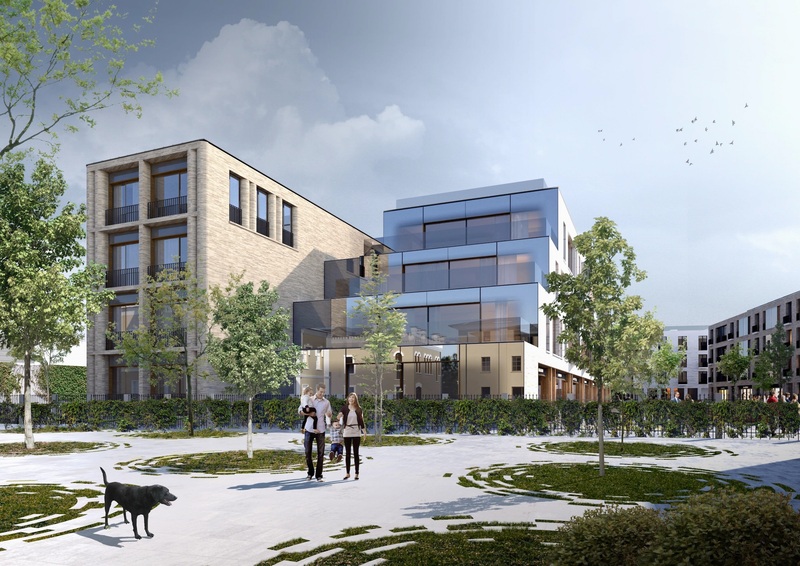 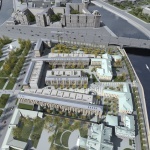 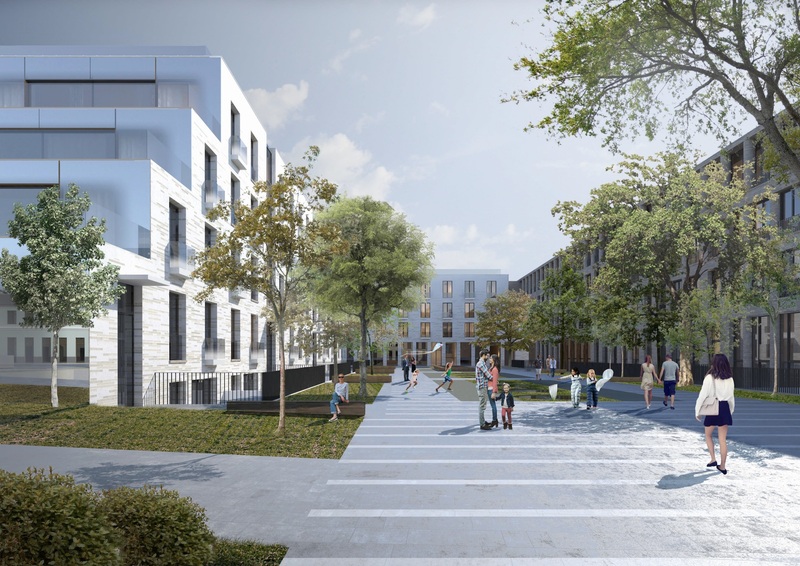 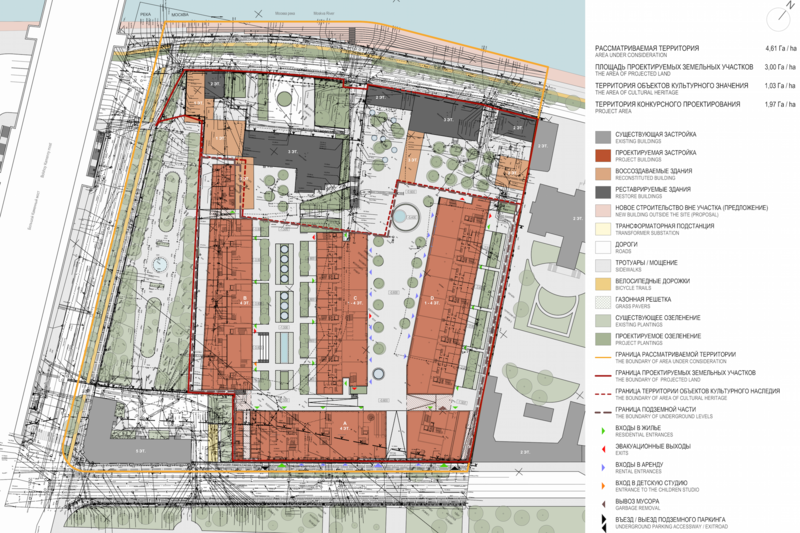 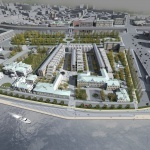 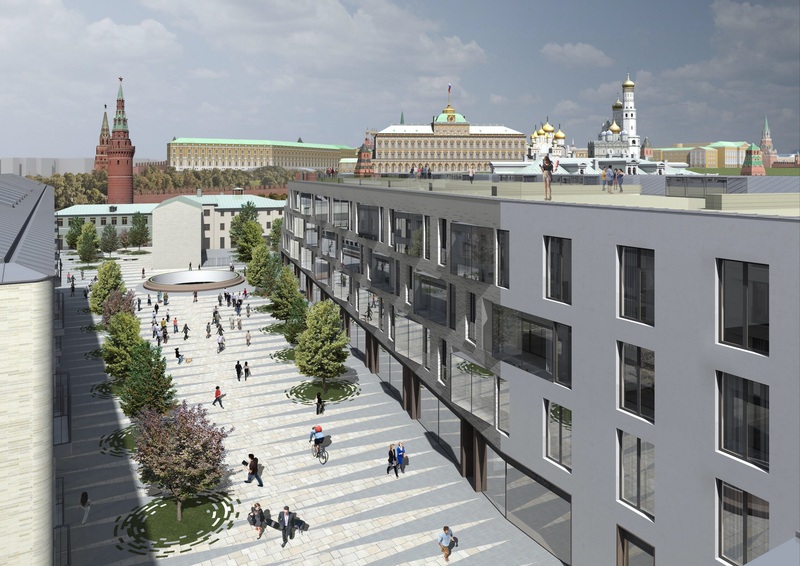 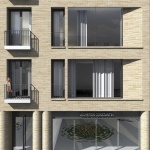 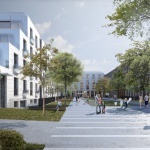 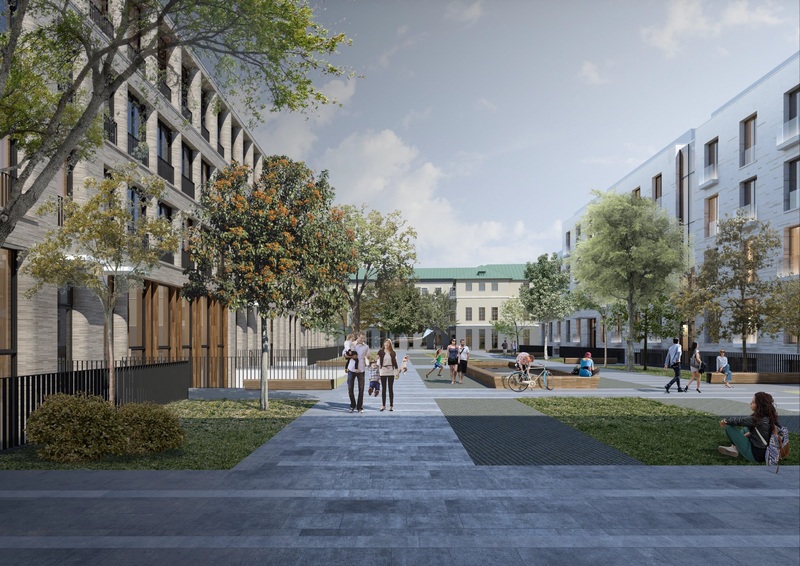 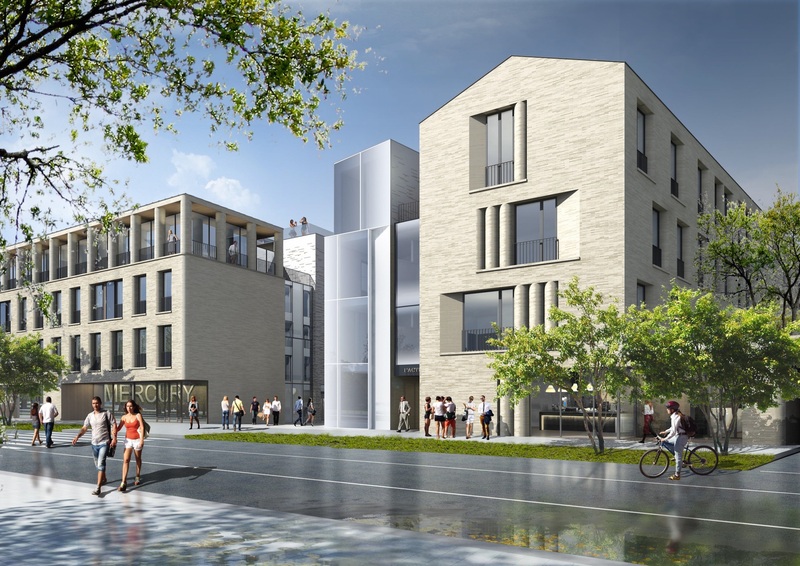 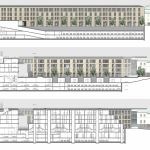 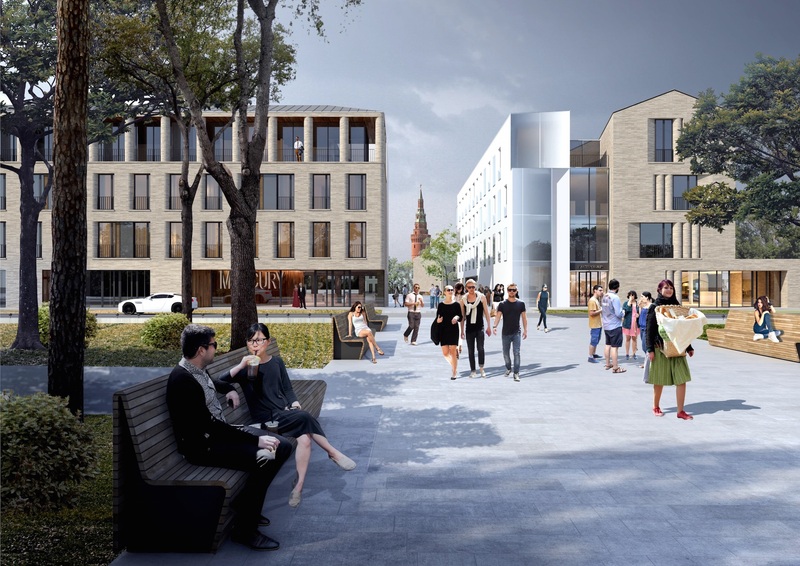 This decision is assisted by visually wide alley crossing Bolotny park and by entrance “opening” of the new residential block, which goes further through inner public space. 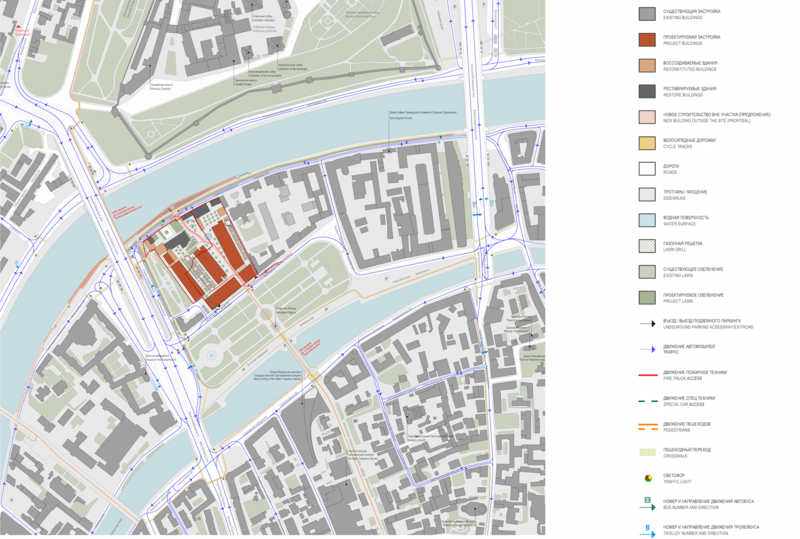 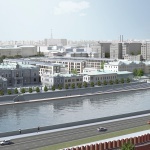 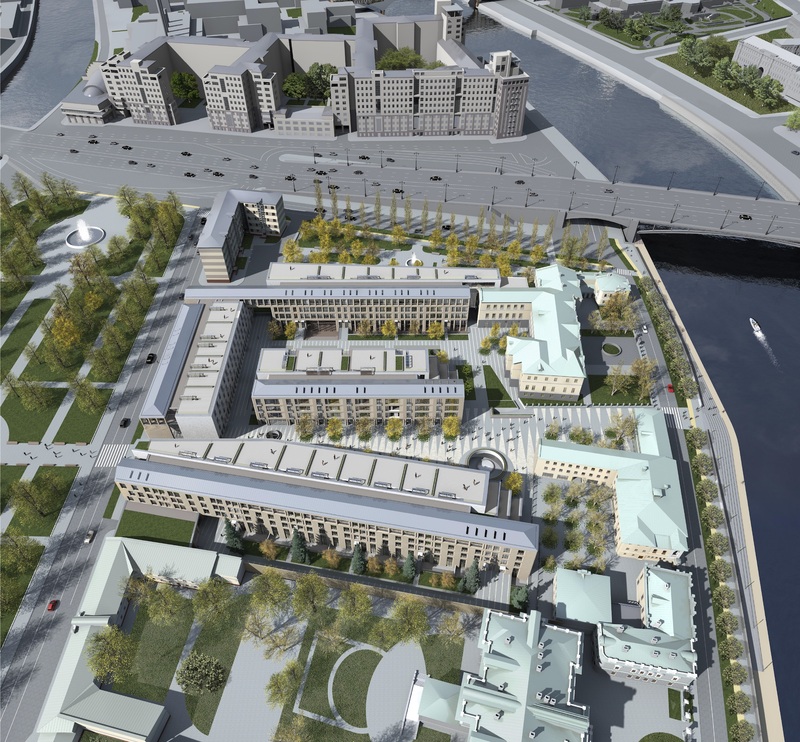 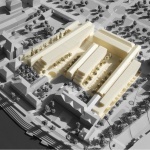 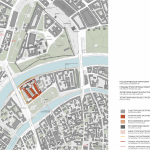 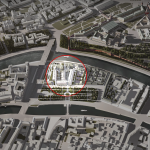 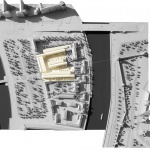 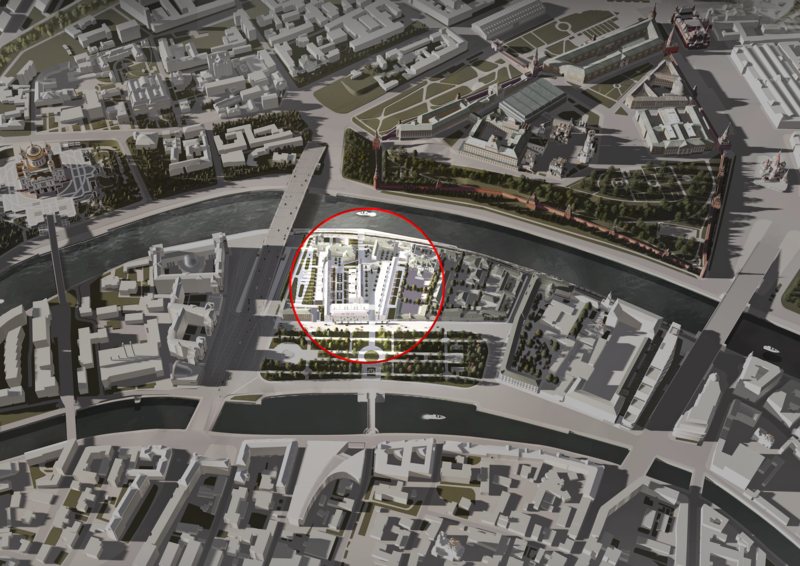 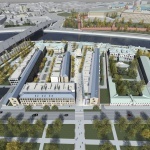 New axis makes the residential block a natural and necessary element of Moscow urbanism, just like such axes in Paris lead pedestrians over Seine river and Site island in the direction of Notre-Dame Cathedral towers. 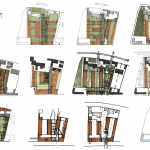 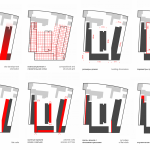 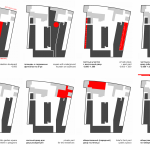 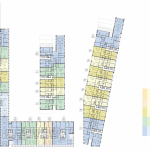 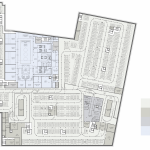 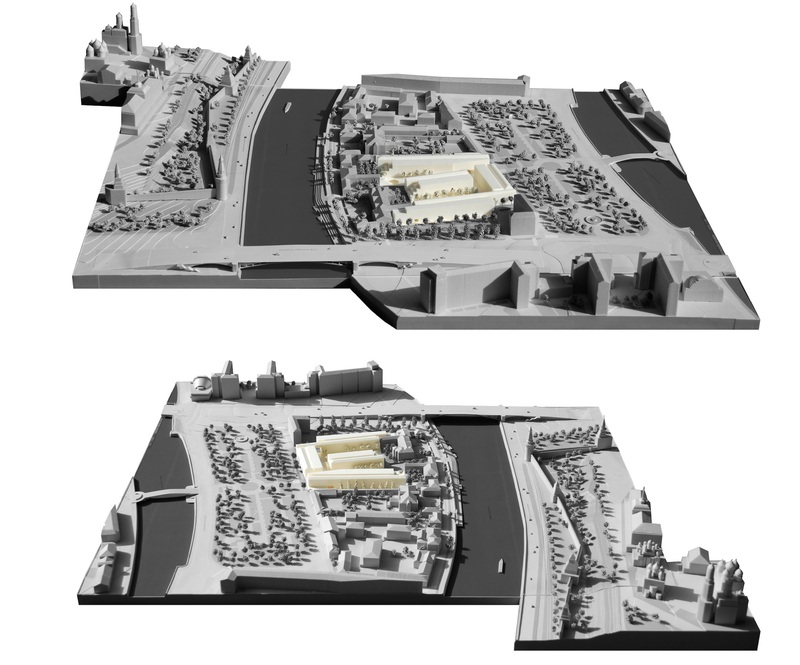 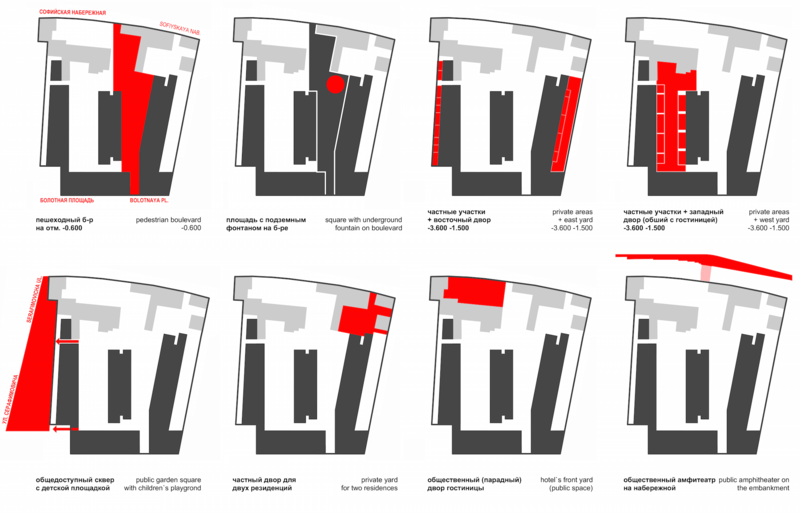 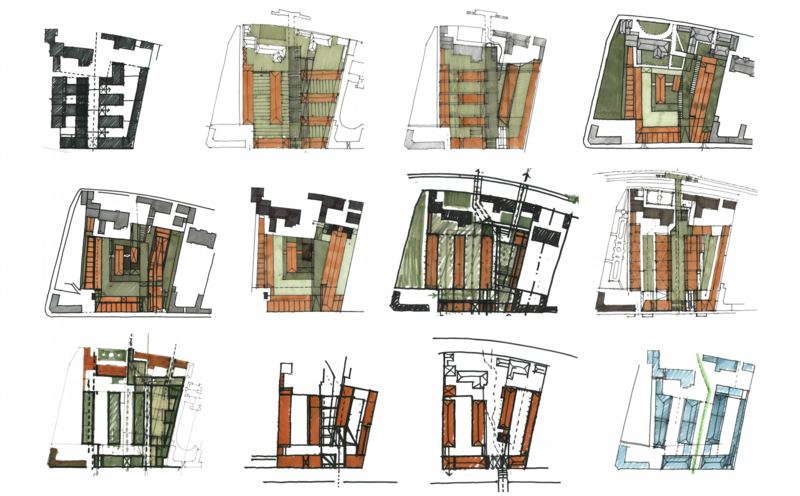 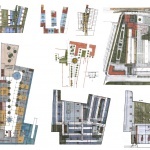 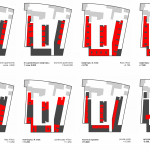 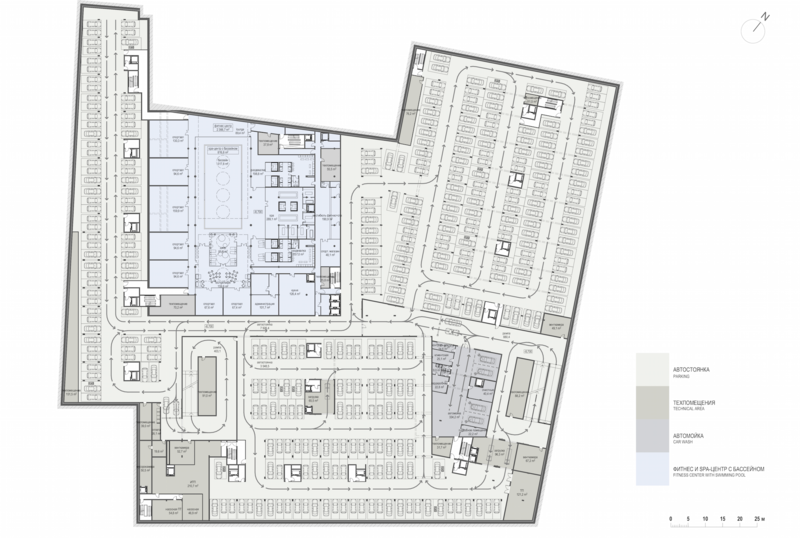 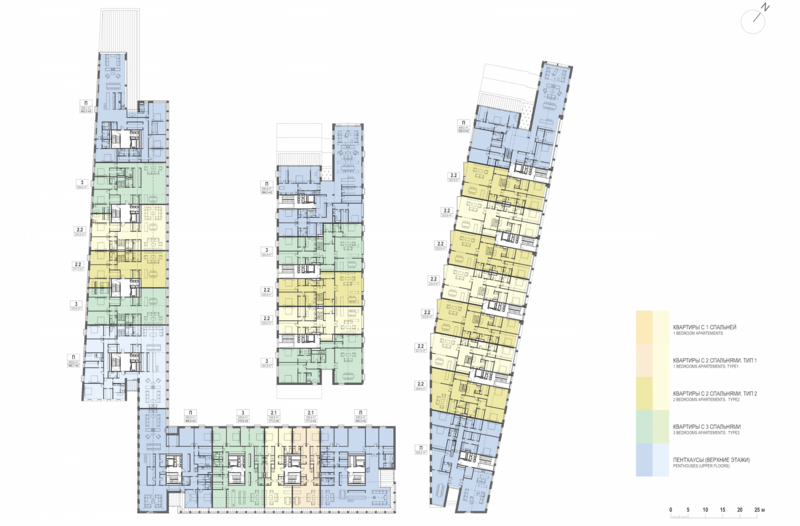 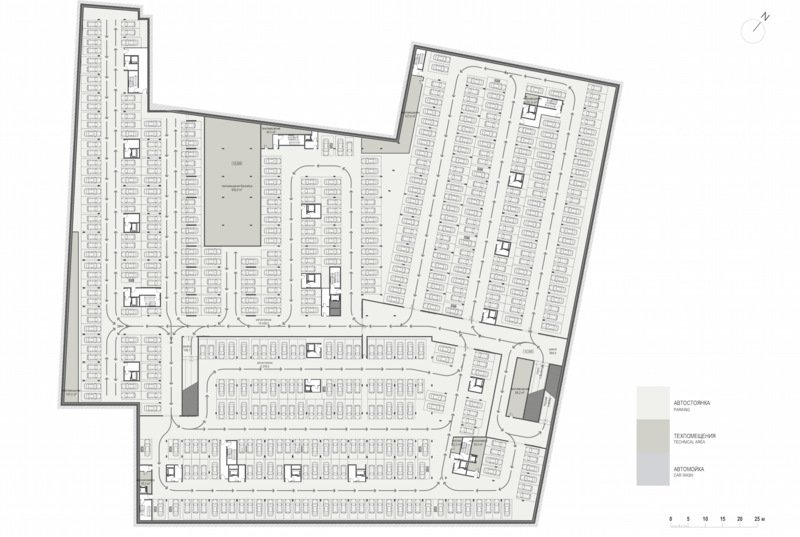 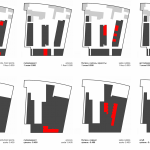 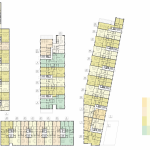 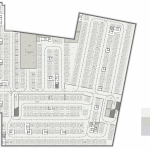 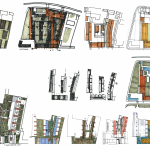 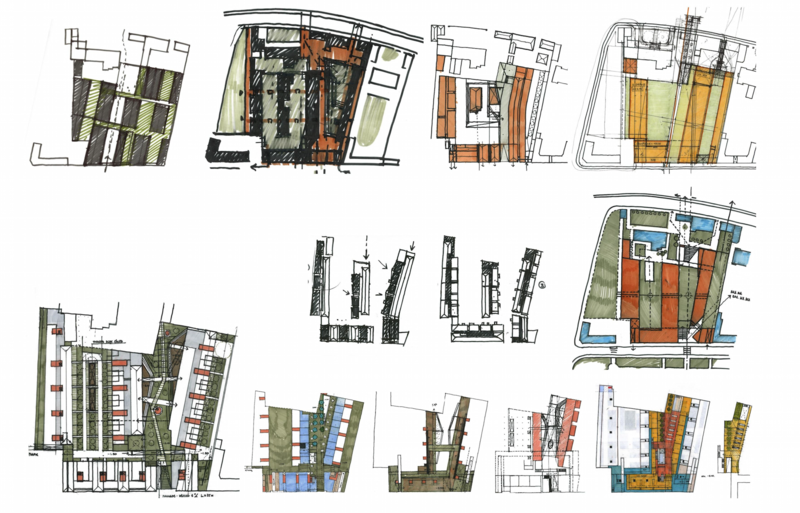 The way of dividing the buildings in three longitudinal units with roofs of different types and height (sloped and flat) produces a picturesque outline of roofs. 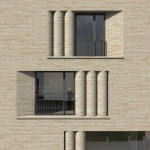 It helps to make smooth and gentle transition of heights from old buildings to new ones. 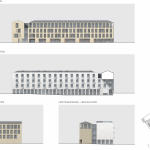 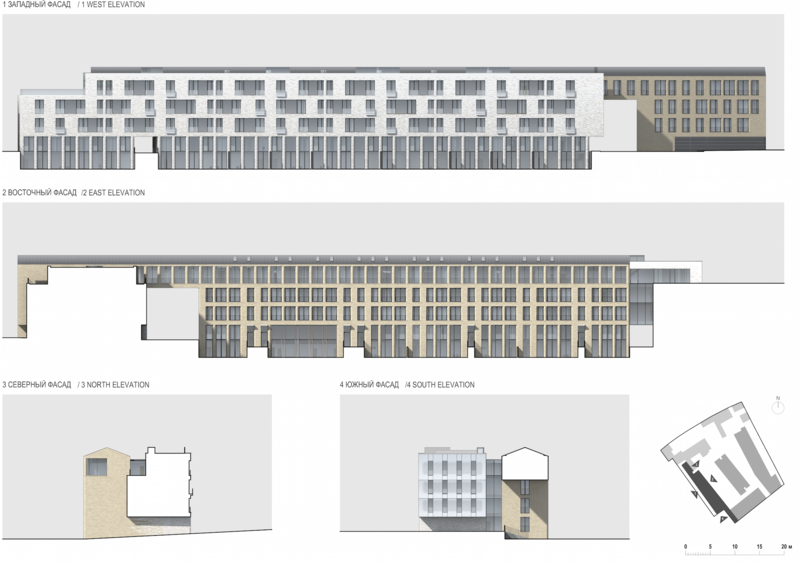 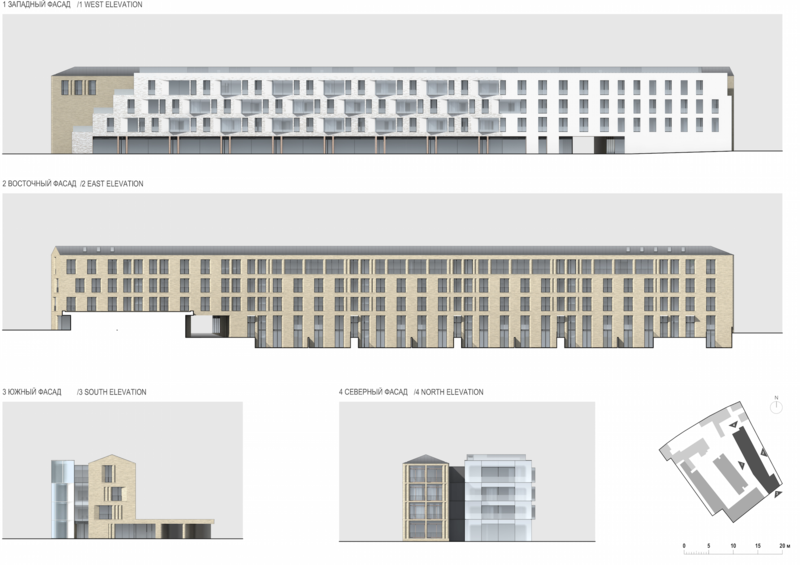 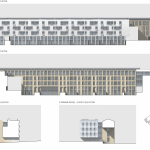 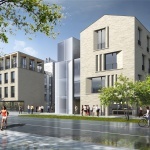 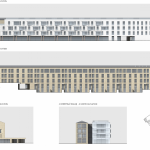 The basic motifs and façade materials support the idea of integration into the urban fabric. 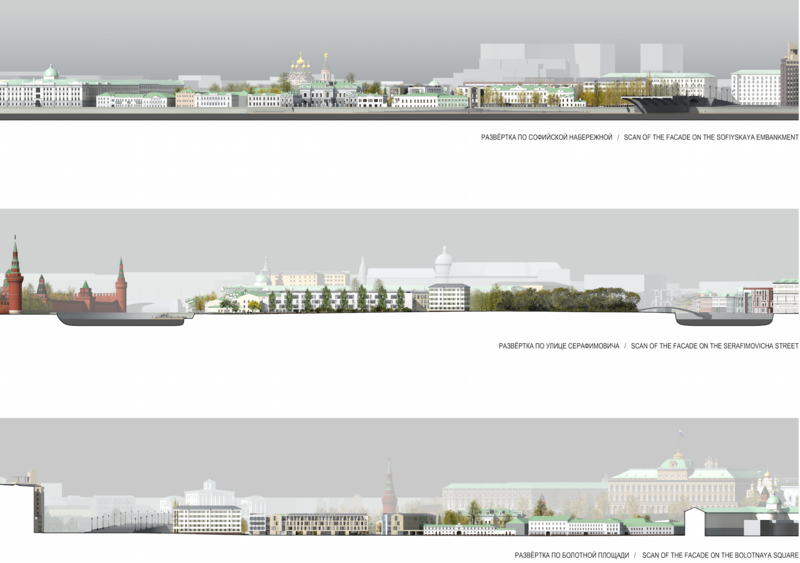 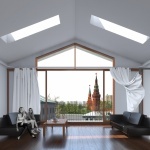 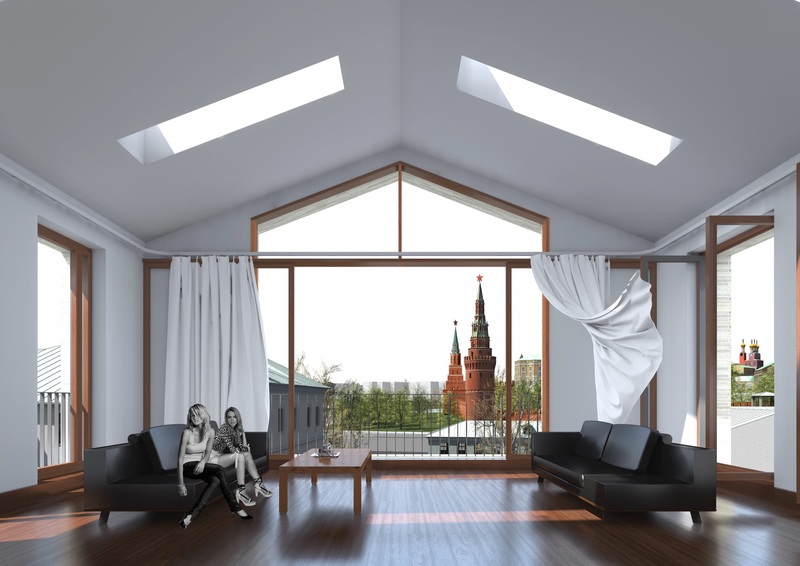 Soft transformation of many faces of Moscow architectural tradition into fresh, light, dare and highly functional modern reality was also the essential part of the author`s idea. 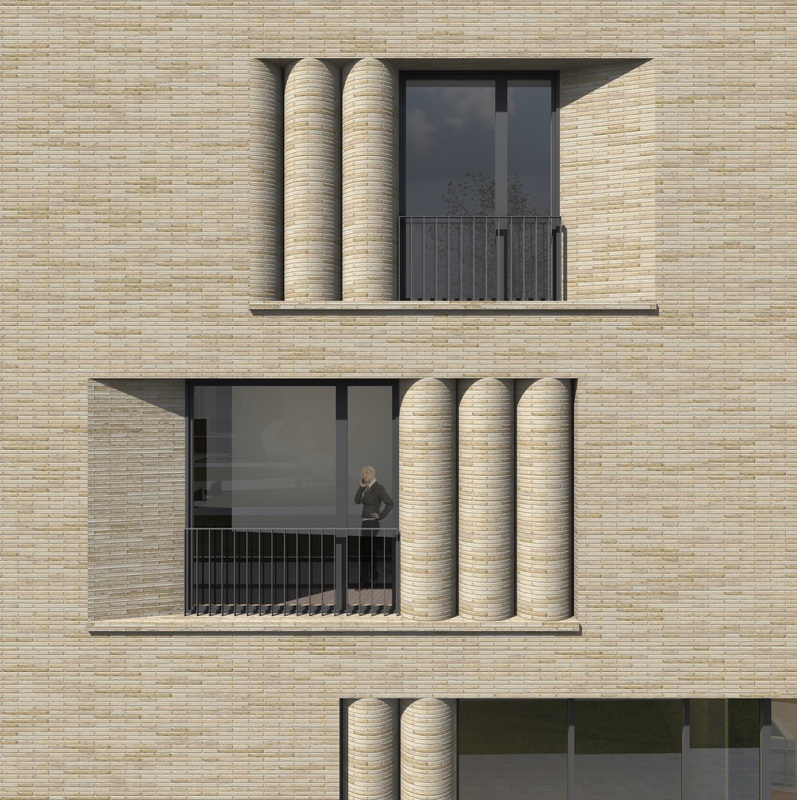 Warm and solid facture of clinker brick supports the austere power of classic elements – columns, sloped roofs, deeply indented window frames. 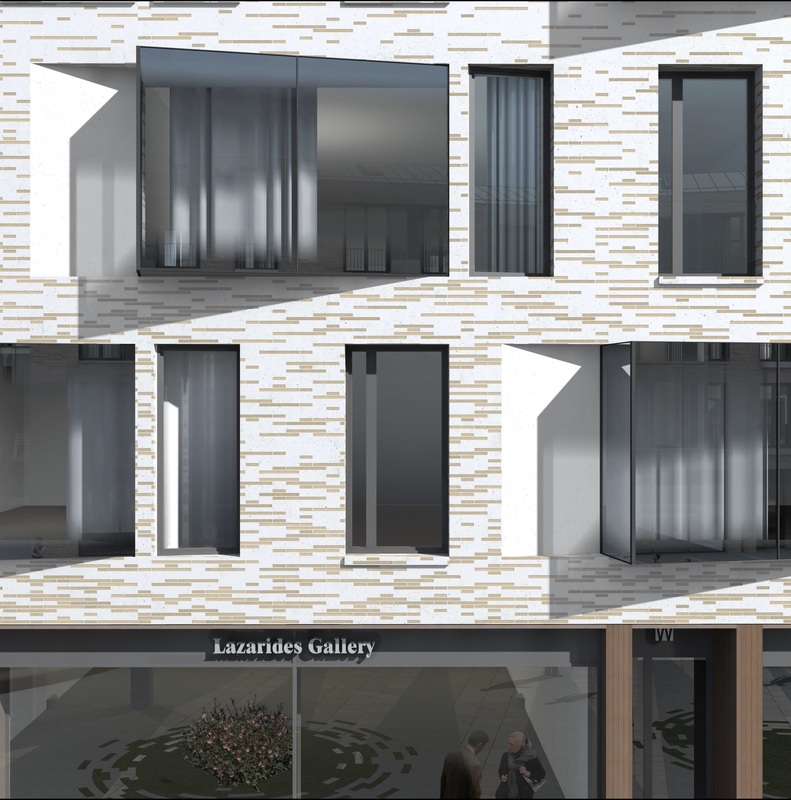 We can see the transition of the texture of facades over the light glass pauses to the bright whiteness of polished concrete. 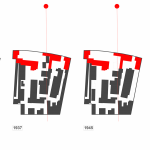 This seeming duplicity was intentional step in time and in space, reflecting changes in local moods: from attempts to monumentalize history to pure simplicity, from primness to candor, from pathos to functionality. 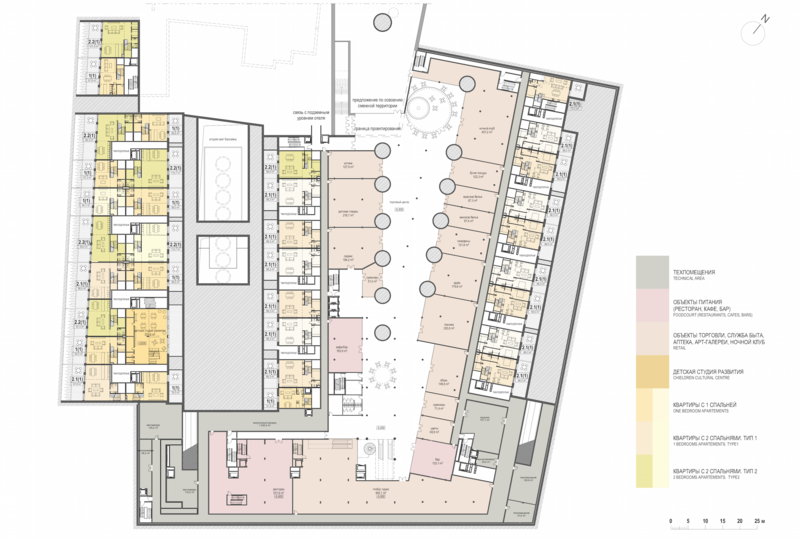 The character of the block as a whole reminds a new comfortable and functional audience hall in the old theatre. 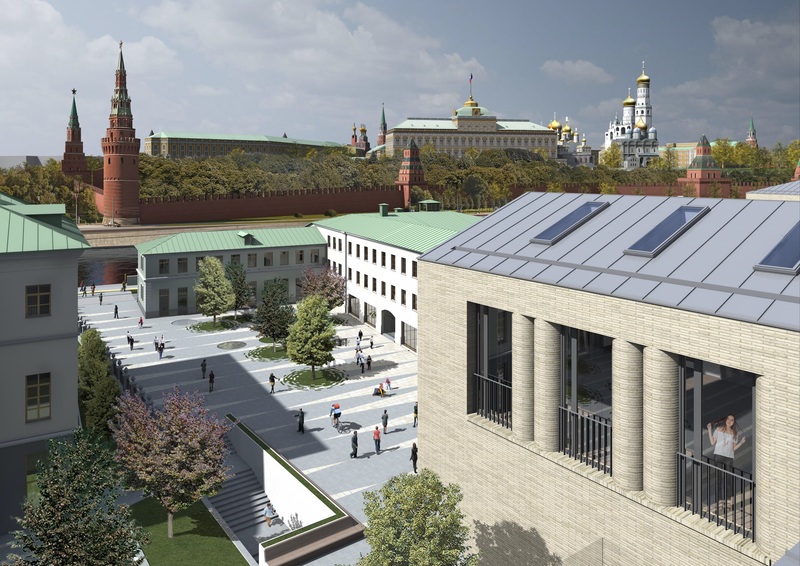 We sit in front of the Eternal City stage and watch the breathtaking performance where Moscow Kremlin has a title role.